The name at the top is hard to read, but it is possibly A. Rosenstock & Co., who were located here at 132-136 N. Sycamore St. from 1889 until 1929/30. They were dry goods merchants who changed into a department store in their later designation. The founder was Anthony Rosenstock (1833-1906). According to a passport application dated 1900 Anthony Rosenstock was born 22 October 1833 in Melsungen (Hesse), Germany, and emigrated on the S. S. Donau from Hamburg, Germany, 1 November 1853. In the early Petersburg city directories (1872, 1882) Rosenstock had a partner, James Skelton Gilliam, Jr. (1838-1916). James S. Skelton Jr. was born in Prince George County, Virginia. He served in the Confederate army in the Civil War, and he appeared in the 1870 U. S. Census as a dry goods merchant, age 31, living in Petersburg. His death certificate says that he was born 7 October 1838 and that he died 16 July 1916. Gilliam is buried in Blandford Cemetery, Petersburg. Find-A-Grave identifies Rosenstock's burial place as Rod-of Sholom Cemetery, a Jewish cemetery next door to Blandford. This ad for A. Rosenstock appeared in Historical and Industrial Guide to Petersburg, Virgina, compiled by Edward Pollock, 1884. This ad for A. Rosenstock from the Hill Petersburg City Directory is dated 1913, almost 30 years later. The claim in these ads is "established 1859." According to the website butterworthflats.com the present building was constructed in 1889 following a fire that destroyed the Iron Front Building where A. Rosenstock had been located earlier. Anthony Rosenstock's son, Louis Anthony Rosenstock (1870-1934) was listed as employed at A. Rosenstock in 1888. Louis A. Rosenstock became president of A. Rosenstock after his father's death. He was listed as an officer through 1924. Then in 1927, directory lists gave only Gary A. Eichelberger, manager, at A. Rosenstock, and Louis A. Rosenstock was listed as president of American Bonded Warehouse Inc. From this point the Rosenstocks were no longer associated with A. Rosenstock or its successor, Rucker-Rosenstock Inc. In 1929/30 A. Rosenstock merged with the Rucker Dry Goods Co. to form Rucker-Rosenstock Inc., listed in the 1931 Petersburg city directory at 128-136 North Sycamore St. Rucker Dry Goods derived its name from Wallace Morgan Rucker (1863-1938), although its initial listing in Hill's Petersburg City Directory dated 1901-02 listed William A. Cheatwood as president and Harvey L. Simmons as vice-president while Wallace M. Rucker was secretary-treasurer. Rucker Dry Goods was located at 67 North Sycamore St. at that time while A. Rosenstock was slightly further south at 51-53 N. Sycamore. Around 1913 Rucker Dry Goods moved to 47-49 N. Sycamore, next door to A. Rosenstock. An early ad for Rucker Dry Goods is this one from 1913. Renumbering of buildings on North Sycamore Street took place 1 January 1915. Odd numbers on the west side of the street became even numbers, and buildings between Franklin Street and Tabb Street were given 1xx numbers. S. S. Kresge, for instance, at 35 N. Sycamore became 116 N. Sycamore. Woolworth at no. 37 became 118. Rucker Dry Goods at nos. 47-49 became 128-130, and next door, A. Rosenstock at 51-53, was now numbered 132-134. Officers at Rucker Dry Goods remained Cheatwood, Simmons and Wallace M. Rucker until 1911 when president became Isham R. Dyer (who was also secretary at Kent Furniture Co.), and John Alfred Rucker (1870-1963) replaced Simmons as vice-president. J. Alfred Rucker was Wallace M. Rucker's younger brother. Both were born in Amelia County, Virginia, to John Harvey Rucker (1834-1898). John H. Rucker appeared in the 1880 U. S. Census, a farmer living in Leigh, Amelia, Virginia, with his son, John A. 9 years old at the time. By 1915 officers at Rucker Dry Goods were all Ruckers, G. Wallace Rucker, joining J. Alfred and Wallace M. Rucker. George Wallace Rucker (1889-1967) was a nephew of J. Alfred and Wallace M. Rucker. (His father was Alexander P. Rucker, a brother of J. Alfred and and Wallace M.) Wallace M. and G. Wallace Rucker lived together at 630 West Washington Street, Petersburg, in 1910. Before the formation of Rucker Dry Goods ca. 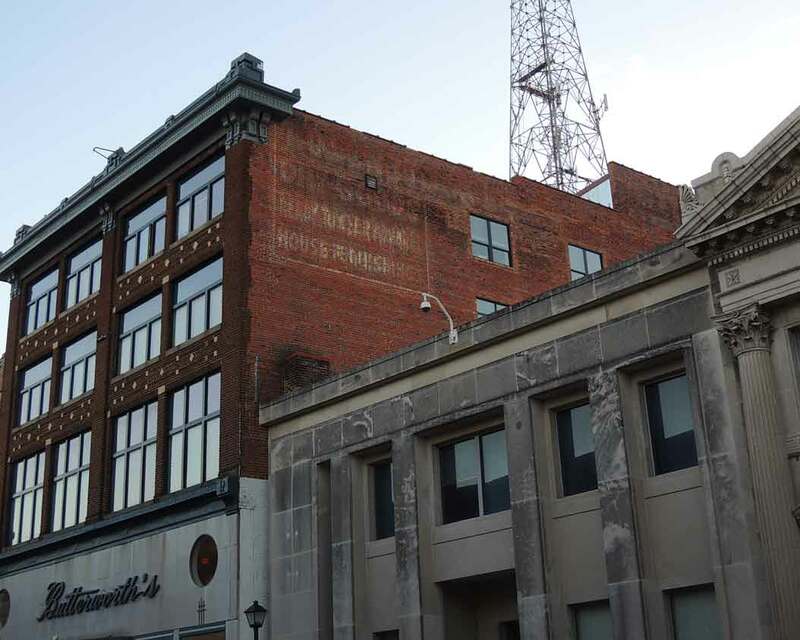 1901, Wallace M. Rucker was a clerk at another Petersburg department store institution, Crowder Bros. Crowder Bros. was in business in the 1870s as Wm. J. Crowder & Sons on Old St. The founder was William J. Crowder (1817-1900), and his sons were Gilbert L. Crowder (1846-1921), William J. Crowder Jr. (1848-1926) and Thomas Clifford Crowder (1850-1921). Their store was located at 238-240 Old St. from the early 1880s through 1914. This address became 238-240 Grove Ave. when the section of Old St. west of Market St. was renamed around 1907. This ad from 1915 has them at 614-616 Grove Avenue, which was their address from 1915 through 1921. The business was listed in Petersburg city directories through 1921. According to a post on uberkayness.blogspot.com Rucker-Rosenstock closed their downtown store in 1968 and opened a store in the Walnut Mall on Crater Road. The new store closed in the late 1970s. But this image from the Richmond Times-Dispatch shows the closing of the downtown Sycamore St. location in 1977.